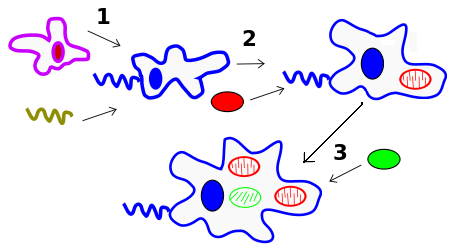 Crude depiction of endosymbiogenetic origins of eukaryote cell. Downloaded from internet without permission/credit (original no longer located/available. current 11:28, 2 October 2017 454 × 252 (35 KB) Tom Henfrey (talk | contribs) Crude depiction of endosymbiogenetic origins of eukaryote cell. Downloaded from internet without permission/credit (original no longer located/available. This page was last edited on 2 October 2017, at 11:28.